Plexidor Pet Doors: International assistance dog week! This week is International Assistance Dog Week, dedicated to all the hard working and devoted assistance dogs that help humans with various tasks all around the world. The goals of this week include honoring and recognizing these fantastic dogs as well as raising awareness and educating the public. Assistance dogs come in all forms and sizes. Some are bred to be guide dogs or hearing dogs, other started their lives under dire circumstances and come from a shelter. Regardless of size and color, they provide independence and change their handler's life. These fantastic dogs provide a wide range of services. They ca be trained to guide a blind human safely through traffic, fetch items, alert for seizures, block oncoming persons and create a safe zone, pull a wheelchair, assist a disabled child, alert for high or low blood sugar, open and close doors, and many other important tasks. 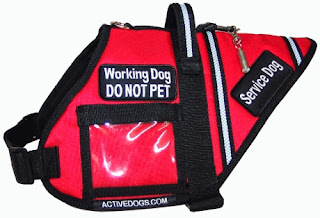 Some service dogs are able to use an ATM and help their handler with everyday tasks such as doing laundry! No matter the size or breed of the dog, or the tasks he or she performs, they all have one thing in common: they offer hope, dignity, and independence. If you see a working dog, leave it alone. This requirement can be difficult to understand for those who aren't dependent on a dog, but consider this: the working dog might be train to detect seizures or other changes in their human that might be life threatening. Through distracting the dog from its job, it might not detect the change or be able to warn the owner in time. Assistance dogs are allowed to accompany their handlers to all places open to the general public and they are not required to wear a vest. Do you use an assistance dog or do you know someone who does? We'd love to hear all about it, leave us a comment!